The FDSA Drum Sieve / Revolving Screen Separator is designed for removing large impurities from good product at high capacities. It is effective at removing rocks, stones, string, paper, timber, product lumps and other large impurities from a wide range of granular and ground raw materials commonly used in the stock feed, flour milling, food and chemical industries. The Drum Sieve is of a heavy duty construction for abrasive and continuous operation. It is a compact machine that will process at high capacities using minimal power. 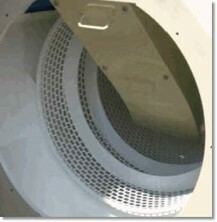 The product enters the Drum Sieve through the inlet spout which conveys it into the perforated screen drum. The screen rotates agitating the material and allowing the good product to fall through the screen. Oversize material is conveyed to the outlet, assisted by the conveying spiral in the second screen section, and exits through the oversize product spout. 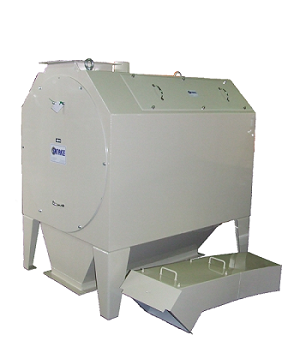 The capacity of the Drum Sieve is dependent on the nature of the raw material and the contaminants to be removed. Screen sizes are selected to suit the application. The screen is kept clean by a heavy duty brush. Satake Australia Pty Ltd are responsible for Satake Corporation’s Group activities in Australia, New Zealand and the Pacific Islands. The company has been operational in Australia since Satake purchased the British company ‘Robinson Milling Systems’ in around 1992. Copyright 2018 @ Satake Australia PTY. LTD.